Late at night, it can be fun to peruse the watch counters at Walmart. It gives me a chance to peruse the watches that are available at affordable prices. Lately, I've been intrigued by the Timex offering at the big discount store. 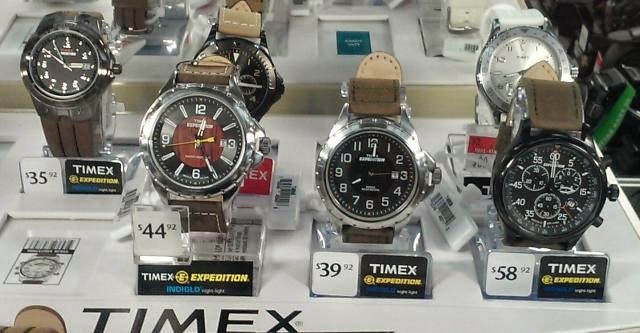 For example, some of the Timex Expedition watches pictured below sell for far higher prices at other brick and mortar retailers. The watch on the far right is intriguing because it reminds me of my AVI-8 Hawker Hurricane watch. However, without the fighter plane motif and insignia, it's not nearly as cool. The Timex Expedition on the far left looks much like my Timex Vintage Metal. It's a birthday gift watch that my wife paid $54 for at Belk. Of the watches pictured, I am most interested in the second watch from the left. 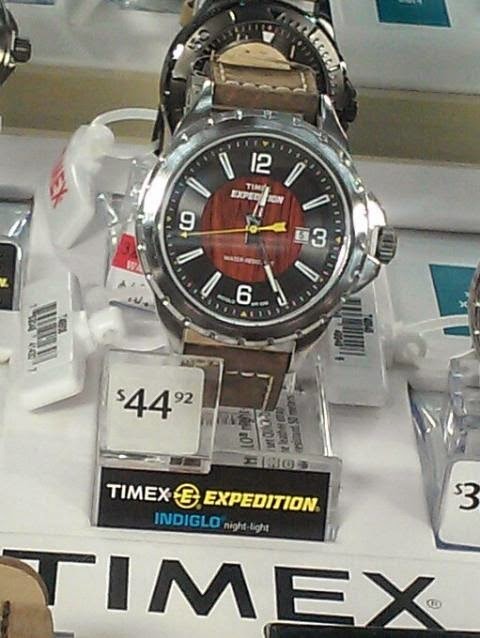 It's Timex Expedition (Model T49908) and it features a simulated wood grain dial. The band is leather. This Timex Expedition provides a natural look at an affordable price. I often find good watches at Walmart on clearance or within the realm of an impulse purchase. Of course, this Timex is available at the best price here on Amazon.